Sometimes superhero comics have the heroes argue over fighting alien invasion vs. fighting more "day to day" villainy. I'm not sure how often Mark Richards is called Ink. It is usually either "the Tattooed Man" or "Tattoo." Trigger warning for some sexist words getting thrown at Vixen. 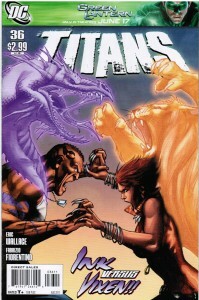 So these are the last two issues of Titans, by Eric Wallace and Travis Moore. After the Flashpoint reboot, Ryan Choi will be alive again and Lian will apparently have never been born, so I don't know how much of this will be sticking. These three panels are from TITANS: VILLAINS FOR HIRE #1 and are considered the fifth worst comic of 2010 according to Comics Alliance. This introduces the villain Cinder.